With a view to promoting sports, Chief Minister Bhupinder Singh Hooda today announced the state’s employment guarantee policy to ensure a secure future for outstanding sportspersons. Capt Ajay Singh Yadav, Haryana’s Power Minister, will be back in the state capital tomorrow. Angry senior citizens, physically challenged persons and widows today blocked vehicular traffic on the Ratia road here after officials responsible for the distribution of their pension did not reach the designated place despite a long wait. 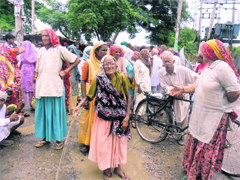 The Indian National Lok Dal today announced that the party would paralyse all vehicular traffic in Sirsa on July 11 in case the authorities failed to pay old-age pension and other social security pensions to the residents by then. At least two murders have taken place in the district in the recent past, resulting in a feeling of insecurity among local residents. While the district has got a new police chief recently, crime appears to have been going on unabated. Blatantly disregarding the Centre’s pleas, the Sonepat district administration has failed to remove encroachments from around a centrally protected monument in the district. “Helpless”, the Centre has now moved the Punjab and Haryana High Court. The authorities prevented the marriage of a minor boy, who was to tie the nuptial knot with a girl from a Rajasthan village. Workers of the district unit of the Haryana Janhit Congress (BL) staged a demonstration at the district headquarters here against the rising prices and increasing crime rate in the district. Demanding the resignation of the state government, the party submitted a memorandum to the Governor, through the Deputy Commissioner. The unsavoury controversy over the date of birth of Gen VK Singh, Chief of Army Staff, has begun to echo in his home state. Ram Kishan Fauji, Haryana Chief Parliamentary Secretary, attached with the Health Department, said under the new “Yashoda Health Scheme”, volunteers would be deployed in the district hospitals of Ambala, Panchkula and Faridabad with more than 3,000 deliveries per year for the Infant and Young Child Feeding (IYCF) counselling to mothers who had recently undergone delivery in the hospital. Tormented by a family belonging to a majority community and due to the alleged lackadaisical attitude of the police and the village sarpanch in providing justice, a Muslim family of Diwana village in this district has been forced to flee its village. Panic has gripped Kathgarh and Rampur villages in Yamunanagar district near the Haryana-UP border following cracks in two dams. 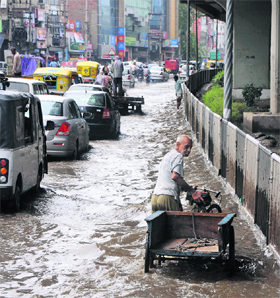 Rainwater entered a large number of houses in the twin towns of Yamunanagar and Jagadhri today after heavy showers.The rain, which started in the morning, crippled life in some parts of the district as rainwater entered houses in low-lying areas, including Rampura Colony, Lajpat Nagar, Azad Nagar and some markets in the city. The drainage system got choked, resulting in water accumulating in the markets. Here is some good news for residents of the Gurgaon municipal area. Now, they will not have to visit the MCG office for routine matters.Local Municipal Commissioner Sudhir Rajpal said here today that a call centre of the MCG would start functioning tomorrow. The police apprehended alleged abductor Satpal and recovered the girl from a hideout in Rewari last evening.The girl was medically examined which confirmed sexual assault. She was later handed over to her parents at Lukhi village, near Nahar. The BJP has taken up the case of suicide by a Dalit youth at Banawali village in this district with the National Human Rights Commission (NHRC).RP Malhotra, convener of the human rights cell of the state BJP, has sent a communication to the NHRC Chairman, attaching a copy of the report “Dalit youth commits suicide” published in The Tribune today. The policy includes offer of employment in government departments, boards and corporations, reservation of seats for admission to professional or technical institutes and universities and the setting up of a Haryana sports development fund. The Chief Minister said under this policy, besides jobs in the police, the sportspersons would now be offered employment in government departments, boards and corporations on the basis of their achievements. Hooda explained that the medal winners of Olympic Games and gold medal winners of Asian Games would be offered posts of class-II gazetted officer while silver and bronze medal winners of Asian Games and gold and silver medal winners of Commonwealth Games and gold medal winners of world championships organised by sports federations would be offered class-III posts. Besides, suitable employment opportunities would be offered to the participants of world championships organised by sports federations and medal winners of Asian championships. “As many 3 per cent seats would be reserved for sportspersons in professional or technical institutes and universities from the year 2011-12. A “Haryana sports development fund” with a corpus of Rs 5 crore would be set up to provide financial assistance,” he added. The annual Bhim Puraskar would be conferred upon three sportspersons of individual games and two sportspersons of team games and one to a para-Olympic player, he maintained. Hooda said Haryana was the first state in the country to give the maximum cash award to medal winners of Commonwealth Games and Asian Games. In the case of Commonwealth Games, the gold, silver and bronze medal winner were given Rs 15 lakh, Rs 10 lakh and Rs 5 lakh, respectively. Similarly, in the case of Asian Games, the gold, silver and bronze medal winners were awarded Rs 25 lakh, Rs 15 lakh and Rs 10 lakh, respectively. Also, funds were given for development of native villages of medal winners of Asian and Commonwealth Games. The villages of gold, silver and bronze medal winners were given Rs 51 lakh, Rs 31 lakh and Rs 21 lakh, respectively. “As many as 37 sportspersons have been offered jobs in the Police Department. While posts of DSP have been offered to five sports persons, 18 of them have been offered employment as Inspectors and 14 as Sub-Inspectors,” Hooda said. Bhupinder Singh Hooda on June 14. It is learnt that Yadav decided to come back to Chandigarh after a meeting with AICC president Sonia Gandhi in Delhi this morning. Sources said Yadav met Sonia for about 15 minutes. Yadav, who was on his way to Chandigarh, described the meeting as a “courtesy call”. Yadav had started clearing important files of his departments from Delhi or Rewari but so far he had not attended his office after the reshuffle of his portfolios. Interestingly, Hooda today left Chandigarh for Delhi, from where he will fly to London tomorrow. The authorities had announced that the senior citizens, physically challenged persons and widows from wards 19 and 20 of the town would be given their pension at Geeta Mandir in Model Town today. The pensioners reached the designated place at the scheduled time of 9 am. However, officials of the Financial Information Network and Operations (FINO), a private company assigned the job of the distribution of the pension, were nowhere to be seen. The pensioners, many of them in their eighties, waited for the officials under the shade of trees in hot and humid conditions for three hours. However, when no one turned up till noon, they blocked vehicular traffic on the nearby Ratia road. The authorities had recently given the task of the distribution of pension in the district to a nationalised bank, which in turn, outsourced it to FINO. Meanwhile, complaints regarding siphoning off the pension of some beneficiaries have been received from wards 4,5 and 9 of the town here. The beneficiaries have complained that their pension for the month of April has been shown as delivered, while they have not received it. DC Ashok Meena said the authorities were taking the complaints of harassment of senior citizens seriously. Abhey Singh Chautala, INLD MLA from Ellenabad, announced this after a large number of senior citizens met him at Bansudhar village during his mass contact programme today and complained of non-payment of pension for the past four months. “We depend on our monthly old-age pension for our daily personal requirements. However, we have not received pension for the past four months,” alleged senior citizens. Later, talking to mediapersons, Abhey Singh announced that he would wait till July 10, as the state government had recently stated that the social security pensions would be paid to its beneficiaries by the 10th of every month. “However, if the authorities fail to pay the entire pension amount and arrears of the past months to the senior citizens and other beneficiaries by then, the INLD will organise a demonstration along with the beneficiaries in front of the mini secretariat here on July 11. Party workers will burn an effigy of the Haryana government and will bring Sirsa to a standstill by organising a “chakka jam” in the town,” the INLD MLA declared. Though one of the victims belongs to the Dalit community and is reported to have been beaten to death on Saturday night at Amrawali Khera village of the district, the police recovered the body of a youth from a spot near Nirankari Bhawan here on Monday night. The body bears injuries marks. It is suspected that the victim could have been murdered. This is third such incident in the district in the past month. A total of 12 incidents of murder have been reported in the district this year. The police was yet to arrest the accused, who had allegedly beaten up a youth, Pradip, to death on Saturday night at the village. It is revealed that the family of Tek Ram, where the deceased used to work as a labourer had allegedly assaulted him, with sticks, which led to his death. Astonished at the Centre’s predicament, the high court has virtually passed strictures on the district administration. Indicating that the Deputy Commissioner’s alleged inaction could be brought to the notice of the higher-ups, including the Commissioner and the state government, the high court has ruled: “Such matters can easily be settled between the Centre and the state government concerned without invoking jurisdiction of the writ court”. Justice Ranjit Singh has also suggested that the Centre “can always” approach a civil court on the issue. The Centre had earlier moved the court for direction to the state of Haryana and other respondents to stop illegal and unauthorised encroachment and construction by local residents around KOS Minar, Akbarpur Barota. The Centre had claimed in its petition that the local administration, including the Sonepat Deputy Commissioner, SP and the SHO of Police Station, City, had done nothing to stop the illegal construction. Taking up the matter, Justice Ranjit Singh asserted: “It is strange to notice that the Central Government or the state government is not able to exercise effective control over the district administration”. “The Union of India can certainly approach the state government for ensuring proper action in accordance with law. If the Deputy Commissioner has not acted in the matter, the issue can be raised with the Commissioner or other superiors, including the state government, instead of rushing to file a writ petition, as has been done”. Justice Ranjit Singh added: “Is it that the writ court is required to intervene at the instance of the Central Government to issue direction to a state government or its agents to perform their duties in accordance with law? “Surely, the Central Government is not that helpless to take the help of a writ court. There would be more than one modes for the Central Government to ensure that the state government takes action to protect the monuments”. Child Marriage Prohibition Officer Sadhna Mittal, who had received a tip-off that Sanjay, son of Shankar Lal of Kukarthana village near Ding in this district, was a minor and his parents had fixed his marriage for today, intervened before his marriage party could leave for Rajasthan. Mittal reached the village with a police force and demanded proof of Sanjay’s age. Sanjay’s parents failed to furnish any certificate, though they claimed that he was above 21 years of age. The protesters led by Vijender Singal, the district chief of the party, condemned both the state and the Centre for the ever-increasing prices of the basic commodities. He said the government had failed to control the rising prices and the increasing crime rate in the district and the state as a whole. He further said the rising prices would adversely affect the common man. Hike in diesel prices would increase the prices of DAP and Urea, which would put an additional burden on poor farmers. Claiming that the law and order situation had gone from bad to worse, he said the police inability to take action against the two former Ministers of the Hooda government against whom direct allegations had been levelled by the family members of the former sarpanch Karam Singh had been an example of the justice being given to the common man. Gen Singh hails from Bapoda village in Bhiwani district. Haryana has at present about 1.6 lakh men serving in the Army and there are several lakh ex-servicemen in the state who are perturbed over the controversy. The Rohtak chapter of the Ex-Servicemen of Grenadiers Association has shot off a letter to the Prime Minister, expressing dismay over the controversy. Gen Singh’s date of birth, as mentioned in the form he filled for the entrance test for the NDA conducted by the UPSC way back in the mid-sixties, is May 10, 1950. However, the date of birth in his matriculation certificate is May 10, 1951. The issue has assumed significance as it impacts the line of succession for the top Army job . If Gen Singh continues in office for an additional year, the next Corps Commander in the line of succession will have to retire in his present rank. The Grenadiers Association has stated in its letter that when Gen Singh applied for admission to the NDA, the age for entry was 15 years. Had he been born in 1950, his candidature would have been rejected straightway. It adds that The Adjutant-General branch of the Army issues instructions to all candidates cleared by the UPSC to join the NDA. These clearly mention that all candidates must submit their matriculation certificates otherwise their candidature will remain provisional. This is the inherent policy of the defence forces. Gen Singh submitted his matriculation certificate to the NDA with his date of birth as May 10, 1951. Col BS Koshal (retd) , President of the Rohtak chapter of the association, says that in the Army the official records of all officers are maintained by the Adjutant-General branch. The AG branch is the proper authority and its records form the basis of every officer’s service record while in service and after retirement too. Gen Singh’s date of birth in the records of the Adjutant-General Branch is May 10, 1951. On the other hand, Col Koshal said the Military Secretary branch maintains records only for promotions and postings. In Gen Singh’s case the Military Secretary branch had maintained the date of birth as per the UPSC application form. When the UPSC itself had cleared his entry into the NDA based on the board certificate mentioning his date of birth as May 10, 1951, obviously the Military Secretary branch had erred gravely. Since officers do not have access to the MS branch records, they could never know about any discrepancy, he added. Capt AS Malik (retd), secretary of the association, said the unnecessary controversy was affecting the morale of the Army. He said justice should be done to Gen Singh. Attributing the controversy to some retired senior officers facing court martial proceedings he said the Defence Ministry should lose no time in putting the row to rest. While giving details of the project, Fauji said the districts had been selected on the annual delivery rate, Ambala - 3,200 cases, Panchkula - 5,542 cases and Faridabad - 4,200 cases. For this purpose, the state government had earmarked Rs 12.8 lakh for all district hospitals. He added that the Yashoda Scheme would soon be extended to all other government hospitals also. He said for each district eight Yashoda volunteers would be employed for three shifts of eight hours each, supported by a pair as a reliever. There would be one Yashoda per five to six women in each shift. Each Yashoda would be provided with an incentive of Rs 100 per delivery, which would enable one Yashoda to earn Rs 3,000 to Rs 3,500 per month. Fauji added that the Yashodas would work under the supervision a retired nurse, who would act as a Yashoda supervisor. She would be paid Rs 7,500 per month. He said seminars would also be conducted for generating awareness regarding correct feeding practises and the Infant Milk Substitute (IMS) Act among doctors and the health staff. He said a booklet in Hindi would also be provided to each mother, undergoing counselling with information on the benefit of bathing, early breastfeeding, immunisation and intake of healthy food. Fauji added that Yashoda would facilitate registration of mothers at the time of women reaching the hospital for delivery, act as a companion during delivery and also help in cleaning, wrapping and putting identification tag to newborn, care of newborn, recording of birth weight, support to mother and early initiation of breastfeeding . The family, which eked out a living by etching on wooden items for the past 20 years in Diwana village, has shifted to Karandi village. Some relatives of the family members also live there. A lock on the main gate greets visitors to the house of Chanan Khan in Diwana village. The family members said they were not in a position to return to their house and they would have to start life afresh in the new village. “My younger brother, Gurdeep Khan, was beaten up by a neighbour and his two sons on June 22, because he was listening to music on his mobile. Though Gurdeep told them that the volume of his mobile was low, they did not listen to him and beat him up as hurled abuses on us,” alleged Kuldeep Khan, son of Chanan Khan. He said his father brought the matter to the notice of the village sarpanch and pleaded for justice, but the village panchayat did not show any concern for them. Later, the Muslim family approached the police and lodged a complaint at the Jakhal police station. However, the police, too, failed to provide succour to the Muslim family. Kuldeep alleged that an ASI came to their village and went back after meeting their persecutors and threatened the family with dire consequences. “This emboldened our neighbour and on the night of June 24, his sons barged into our house in an inebriated condition. They misbehaved with my wife, Manpreet, and tried to drag her outside,” alleged Kuldeep. Left with no option, Chanan decided to bid adieu to the village. Iqbal Singh, a former sarpanch of the village, said it was shameful that the police was trying to pressure the Muslim family rather than taking action against their persecutors. Dilbag Singh, SHO of the Jakhal police station, said it was a small dispute and would be amicably resolved. “We have told both the parties that the police will act under Section 107/151 of the CrPC against both in case they faile to resolve their dispute soon,” he added. According to sources, the two dams were built in 2006 and a sum of Rs 57 lakh was spent on each dam. The dams were built under the Community Forestry Project, Yamunanagar Division, and water from these tanks was to be used by farmers for irrigation and cattle. The sources said the average lifespan of these dams was 15 to 20 years. Residents of nearby villages alleged that these dams had developed cracks as substandard material was used in the construction. The villagers alleged that they had suffered heavy losses in the past due to the flooding of their crops by the swirling waters of the Somnadi, Pathrala and Yamuna rivers. They said these swollen rivers had wrecked havoc and upset their economic condition. The villagers said they had been guarding these two dams throughout the night for the past couple of days after the onset of the monsoon. They said they apprehended trouble if the two dams gave way. Divisional Forest Officer Rajesh Gulia said he had issued orders to plug the cracks in the two dams. A number of areas in Jagadhri were waterlogged following incessant rain throughout the day. Residents of waterlogged colonies criticised the authorities concerned for failing to take adequate steps for proper drainage. “This problem arises every year, but no measures are taken. The tall claims made by officials stand exposed today,” a resident complained. Meanwhile, the district administration has issued an alert in a number of villages along the Yamuna. With heavy rain in the catchment areas of the Yamuna, the river has swollen with about 80,000 cusecs of discharge recorded at the Hathnikund barrage today. Sources said the machinery being used for carrying out repairs on an embankment by a contractor was washed away due to the heavy flow of water in the Yamuna. Panic gripped villages along the Yamuna. However, no loss of life was reported from any part of the district till this evening. With the commissioning of the call centre, the local residents can lodge their complaints and later check the status on toll-free telephone No. - 18601801817. The complainant would be given a registration number after registering the complaint, which can be used subsequently to check the status of their complaints. The centre will function from 7am to 7pm on all seven days of the week. The residents can also get information about various services and facilities given by the MCG on the helpline number. The services covered under the scheme include birth and death registration, provision of the RTI-related information, issuance of licenses and NOCs, door-to-door garbage collection, NOCs for installation of mobile towers, depositing of house tax and getting copies of house tax bills and installation/replacement of streetlights etc. Satpal was today produced before the vacation Judge here, who remanded him in 14-day judicial custody. The girl, a minor, was enticed away by Satpal from Lukhi village on June 25.